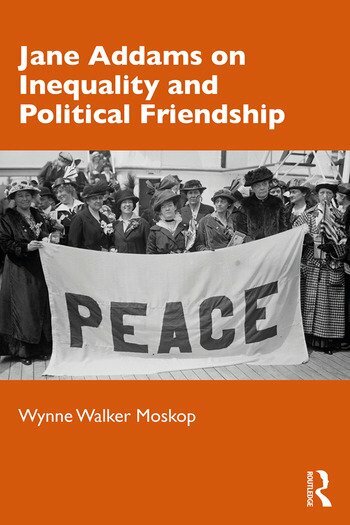 In this book, Wynne Walker Moskop addresses the practical and theoretical problem of how unequal political friendships evolve toward arrangements the parties consider reciprocal and just, a problem neglected by scholars of democracy that associate reciprocity and justice only with equal parties. Jane Addams may have insisted that Hull House was not a charity with philanthropic aspirations, but it still had to bring "two classes" to a shared purpose and more egalitarian relation. Drawing on several bodies of scholarship—including Addams’s writings, secondary works about her collaborations, literature on Aristotelian political friendship, and feminist scholarship on the global migration of care workers—Moskop shows the importance of Addams's practices to the continuing relevance of unequal economic relations for shaping possibilities for political friendship. Contributing to a lively conversation about Addams’s work as a pragmatist thinker and social reformer that began three decades ago, Jane Addams on Inequality and Political Friendship is an invaluable resource to students of democratic theory, feminist political theory and philosophy, and American pragmatism who have overlooked conditions for friendship and justice in unequal relations, but need to, given the subordination of peoples because of race, class, gender, religion, and citizenship status in the U.S. and transnationally. Wynne Walker Moskop is Associate Professor of Political Science and affiliate Associate Professor of Women’s and Gender Studies at Saint Louis University. Moskop teaches undergraduate and graduate courses on American political thought, feminist theory, contemporary ideologies, and the history of political thought. Her articles and reviews have appeared in a range of journals, including American Political Thought, American Quarterly, the Journal of Political Psychology, American Studies, Political Theory, American Political Science Review, the Quarterly Journal of Ideology, and The Journal.